Ras al Khaimah has welcomed the World Travel Awards (WTA) Middle East Gala Ceremony for the first time, with the best of regional hospitality recognised at the event this evening. The ceremony marked the start of the WTA Grand Tour 2018. The Ritz-Carlton Ras Al Khaimah, Al Wadi Desert, was among the big winners, taking the title of Middle East’s Leading Luxury Desert Resort. Voters also honoured Ras al Khaimah Tourism Development Authority, which was recognised as the Middle East’s Leading Adventure Tourism Destination. On a special night for the northern most emirate, the newly opened ToroVerde zipline was presented with the title of Middle East’s Leading Adventure Tourist Attraction. 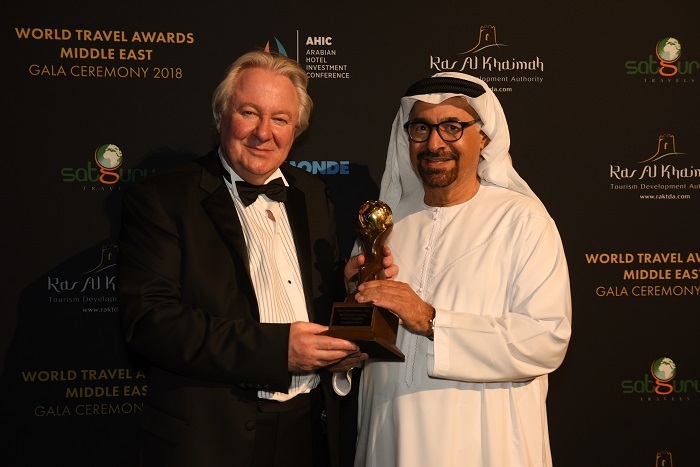 As World Travel Awards celebrates its silver jubilee, the organisation gave the prestigious title of Middle East’s Leading Travel Personality to Nasser Al Nowais, chairman, Rotana Hotel Management Corporation. The event took place at the Waldorf Astoria Ras al Khaimah, which was itself revealed as Ras Al Khaimah’s Leading Resort. World Travel Awards President and Founder, Graham Cooke, said: “What an evening it has been here in Ras al Khaimah at the Waldorf Astoria. In the hospitality sector, The Oberoi Beach Resort, Al Zorah, took the title of Middle East’s Leading Luxury Villa Resort. In aviation, Oman Air was honoured with trophies for both Middle East’s Leading Airline - Business Class: and Middle East’s Leading Airline - Economy Class. Dubai-based Emirates took the title of Middle East’s Leading Airline. United Arab Emirates flag-carrier Etihad Airways took the titles of Middle East’s Leading Airline Website and Middle East’s Leading Airline Rewards Programme for Etihad Guest. A natural complement to the bright lights and skyscrapers of Dubai just 45 minutes’ drive away, Ras al Khaimah offers authentic and nature-based adventure and culture, with year-round sunshine, spectacular landscapes, 64 kilometres of sandy beaches, enticing desert adventures, adventure sports activities in the mountains and first-class places to stay. Haitham Mattar, chief executive, Ras Al Khaimah Tourism Development Authority, said: “It has been a great honour to welcome the prestigious World Travel Awards Gala Ceremony for the first time to Ras Al Khaimah, an event that brings together travel industry leaders worldwide. The World Travel Awards Middle East Gala Ceremony 2018 took place alongside the Arabian Hotel Investment Conference, which visited the emirate for the first time. The leading hotel investment conference connects business leaders from the international and local markets, driving investment into tourism projects, infrastructure and hotel development across the region. It is attended by the highest calibre international hotel investors of any conference in the Middle East. As part of the Grand Tour 2018, WTA is also hosting ceremonies in Athens (Greece), Jamaica, Hong Kong, Guayaquil (Ecuador), Durban (South Africa), with the winners progressing to the Grand Final in Lisbon (Portugal). The Grand Final will take place Lisbon, Portugal, on December 1st.